In a joint effort by the laboratories of Prof Johnstone from the Peter MacCallum Cancer Centre and Dr Hawkins from The Walter and Eliza Hall Institute of Medical Research in Melbourne, Notch 1 signaling has been targeted as a novel therapeutic for T cell acute lymphoblastic leukemia (T-ALL). Using the notch driven T-ALL mouse model the authors investigate the therapeutic possibility of the histone deacetylase inhibitor (HDACi) panobinostat. The study revealed that the drug was able to regulate T-ALL cellular proliferation, and that this was correlated with a loss of c-Myc expression in these cells. 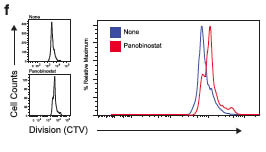 In vivo, Panobinostat treated mice had significantly increased survival compared to vehicle treated control leukemia mouse models. A collaborative effort between Umeå University in Sweden, the University of Melbourne and Murdoch Children’s Research Institute in Melbourne published a population-based study on grandmaternal smoking during pregnancy and the risk of asthma in grandchildren. Lodge et. al. interrogated prospectively collected data from the national Swedish registries to reveal that “children aged 1-6 years had an increased asthma risk if their grandmothers had smoked during pregnancy.” The study further confirmed that maternal smoking did not modify this relationship. In Nature Communications this month the group of Prof Susan Clark from the Garvan Institute of Medical Research in Sydney published on the role of the histone variant H2A.Z in enhancer activation in prostate cancer. Valdés-Mora et. al. reveal that an increased level of H2A.Z acetylation correlates with poor prognosis in prostate cancer samples. 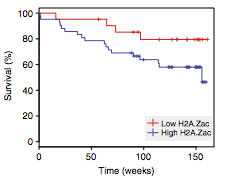 Using prostate cancer cell line models the study shows that androgen receptor associated enhancers require the incorporation of acetylated H2A.Z for activation and that H2A.Zac is mis-localized at active enhancers in cancer. The study further demonstrates that acetylation of H2A.Z nucleosomes is associated with ectopic gene activation and epigenetic remodeling of cancer-specific regulatory elements. Collectively the study demonstrates a novel contribution of H2A.Zac in the activation of newly formed enhancers in prostate cancer. From CSIRO in North Ryde, Sydney Dr Molloy and colleagues address the question of whether “…epigenetic marks present at birth may predict an individual’s future risk of obesity and type 2 diabetes”. For this van Dijk et. al. studied epigenetic marks from blood of newborn children and assessed whether they were associated with body mass index (BMI) and insulin sensitivity in these children later in childhood. In support of growing evidence on the role of epigenetics in programming of metabolic health, the study identified a number of DNA methylation regions at birth that were associated with obesity or insulin sensitivity measurements in childhood. The study also revealed associations between DNA methylation, maternal smoking and birth weight.